Is one of the major constraints of the findings of conventional archaeology the need to resort to ‘guesswork’ when the evidence runs out? Exploring the wider perspective by incorporating results from earth energy dowsing affords the opportunity for deeper insights through repeatable results to be made. Our all-to-brief exploration of the Men-an-Tol site in late May 2000, using simple dowsing techniques, allowed us to explore the exciting opportunities afforded by this way of thinking and to move beyond the restrictions presented by current scientific principles. The title of this article is derived from a comment included in a comprehensive and very interesting report on a study undertaken in 1993 by the Cornwall Archaeological Unit sponsored by the Cornwall County Council (Ann Preston-Jones). The focus of this report was upon erosion and ongoing management issues at the Men-an-Tol site. As an appropriate title for our brief survey, the comment stuck. It not only represented a slight on what is perceived ‘unconventional,’ but seemed also to emphasise the difference between the archaeological and dowsing approaches into research into historic sites. The precise nature of the Men-an-Tol monument remains the subject of speculation. It is possibly of Bronze Age and part of a larger construction, as this article will reveal. 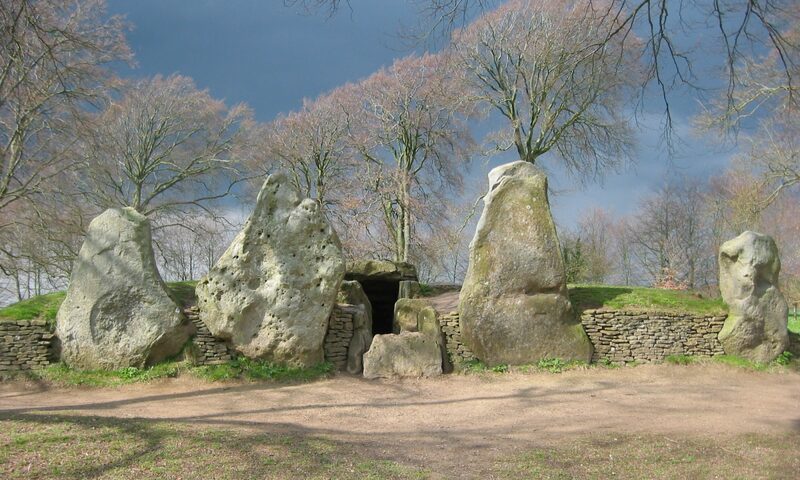 What is visible to the visitor today is a collection of six large stones, some recumbent and, most notably, one having a hole through its centre. This stone is approximately 1.2m in diameter, pierced by a 0.51m hole. Either side of this in a SW to NE alignment are two upright granite rocks each being 1.2m high. Immediately to the SSE of these stones is a low, stony, roughly circular mound up to 0.4m high, which is believed by the Cornwall Archaeological Unit to represent the remains of a cairn. To the west of this group are two recumbent stones, partially buried in the turf and a further, single upright. A great deal of research has been undertaken into the site over the years and early observations refer to enticing descriptions of the healing powers normally associated with holed stones. As documented by Borlaise in 1769, it was believed in the mid 18th Century that by creeping or passing through the hole, cures for backache and rickets could be achieved and witchcraft could be charmed against. John Michell quotes Robert Hunt, in his book The Old Stones of Land’s End who stated that ‘…if scrofulous children are passed naked through the Men-an-Tol three times and then drawn on the grass three times against the sun, it is felt by the faithful that much has been done towards insuring a speedy cure.’ (Robert Hunt: Popular Romances of the West of England, London 1856). There appears to be some difference in opinion among early researchers regarding the precise purpose and positioning of the stones. It is considered likely that the holed stone itself has been moved to its current position and orientation: the fact that it was actually set in concrete during the 20th Century may confirm this notion. The Cornwall Archaeological Unit report includes anecdotal evidence of the complex as being part of a stone circle, references are made to Blight (1864) who focussed upon the presence of further stones around the holed stone and its companions and the possibility that these once formed part of the circle. This theory is significant in the context of our survey of the site. It was all the more significant to us personally since we came to similar conclusions but from a very different perspective. Reviewing the report after we had completed our survey seemed to provide us with ‘confirmation’ of our findings. By 1909, Lockyer was looking at the site from a more scientific perspective, but appears to be limiting his views only to the three main stones. The work undertaken by The Archaeological Unit was thorough, and involved the clearance of gorse and other undergrowth from around the stones, which when we visited the site, seven years later, was still clear. The significance of this clearance was not immediately obvious to us, although needless to say it made our survey of the site a great deal easier! Our short survey presented us with what turned out to be one of the most fascinating puzzles we were faced with whilst dowsing some of the many important sites in the area. And this was in spite of the rain: it seemed that every time we reached for our dowsing rods, the heavens opened and drenched us, a phenomenon we grew accustomed to by the end of the week. The archaeological survey and the Blight report of 1864 were unknown to us at the outset, so the work was carried out blind of any previous studies – we were just doing it for fun, although limited by time and appalling weather. It wasn’t long however before we began finding some very interesting results; the procedures we adopted for decoding the patterns of the local sites were showing some fascinating anomalies. The energies associated with the three main stones suggested they were simply part of, and at one side of, a more sophisticated, highly energetic structure. And after a few hours’ dowsing, punctuated by many conversations with fellow tourists and locals, the results suggested that our suspicions about this site were not unfounded – could it really have once been a stone circle? Dowsing the earth energies, especially those associated with underground water, is recognised by many as being one of the fundamental ways of understanding most of the elements the stone circle formation. Our survey incorporated a set of procedures carried out at each of the local circle sites for the purpose of finding common characteristics. We had found that at other local sites, there was evidence to suggest that we could decode the structure of circles in a number of ways. Blind spring energies at West Penwith circle sites are usually quite numerous, with the odd exception. Generally there is one “central or determining” (for want of a better term) blind spring that has some form of greater significance than the others; it is usually found at the energetic centre of the circle and generally has tributaries, (unlike others) which extend to all of the outlying stones at the perimeter. Major underground flows were certainly present and could be found at both existing and “missing” stones, but as these major underground streams appeared so complex on this site, could we eliminate them from our survey and concentrate on the smaller blind spring flows? This “central” blind spring can be used in the method of plotting the formation when all, or most of, the stones were present. Could we do this on this site as well, with just a few remaining? If it had once been a circle, would the blind spring energies still be present with so many stones missing? We set out to try and investigate. The assumption was made, from previous surveys, that after the stones had been positioned with intent upon the intersections of major flows of underground water, they would attract tributaries from blind springs. As it happens, the three main stones all have blind springs under them, all of them communicating with each other. dowsing the perimeter position of the stones (by dowsing the seventh spiral line from the energetic centre – a common feature found at local sites). (An assumption was made that these water features had not changed significantly since the circle had been created). We were therefore able to determine the apparent shape and size of the “circle” as it was originally constructed, confirming that the existing stones were integral to it and indicating the positions of those that were “missing”. See figure 2. It suggested a circle with 21 stones, including those we found which appeared to have been broken at ground level, and that were also reported in the archaeological survey. We later noted that the archaeological study assumed that there were 20 stones in the circle based on mathematical spacing, but nevertheless, recognised that the typical number of stones in local circles ranged from 20 to 22. Other notable dowsable characteristics included the deep underground features, especially those that followed the course of the main path into and out of the formation. We noted that a number of such deep-water features might easily be “seen” on the surface of the ground in the form of wide paths, and “animal tracks” across the moor. In addition, all water feature energies both inside and outside of all of the circle monuments in this area appeared to be positive or non-depletive in nature. This may be due to the influence of the remaining infrastructure of megalithic sites in the area: the West Penwith region is rich in relatively undisturbed stone structures which arguably still influence each other to this day. Geometrical shapes in the area bounded by the “circle” were also found: sun, crescent moon and animal shapes, and fabulous spiralling patterns in over-lapping figures of eight – ideal for tracing out a megalithic dance routine! The value of the archaeological survey to us could be seen in terms of gaining a degree of ‘proof’ that our findings were not too far off the mark (it is ironic that we were finding it hard to escape from this need to find a ‘scientific’ explanation and verification for what we discovered!). The dowsing results, however, were not only repeatable; a necessity in scientific approach, but more importantly, indicated the number of stones in the circle without resorting to guess work. Were our suspicions correct: was this really a stone circle? The energies found in our brief survey suggested it might well have been. Which discipline, conventional science or dowsing, gives the most accurate survey of the site and which could supply the proof? Our results indicate the dowsing approach is more reliable. And a conclusion? Well, let’s avoid one; it not only spoils the story but also retains the mystery! The Men-an-Tol is a delightful and magical sacred space. It is enchanting as well as energetic, and it takes little imagination to travel into the realms of its past in an attempt to unravel the origins of its purpose. There is certainly more to the site than meets the eye, and we are conscious of ending up with more questions than answers.